Lancaster Trip-Bible Show-The Miracle of Christmas. At this time, the SMCC team wants to say thank to all our family and friends for your cooperation during the entire Lancaster Trip. It was a great success for our Parish. We understood that everyone enjoyed entire trip and were blessed watching the birth of baby Jesus. Thank you so much to all our leaders on each bus. We also extend our thanks to each and every family who shared their food with other families on the bus. As always the SMCC team of Rockland is extending our special thanks to our Spiritual leader Fr.Thadeus for his support and leadership. Happy New Year to all and God Bless. There will not be any CCD Class today and no Sunday Lunch will be provided after the mass. CCD Childrens are requested to attend the Malayalam Mass at 11am. A meeting of the Family Night volunteers will be held in the church social hall this Thursday (12/28/2017)at 8:30 p.m. We need more volunteers to help with preparation of the event and please feel free to join us for the meeting. Details: 3.30 pm - 4.30 pm - Social Hour with appetizers. 4.30 pm 9.0Pm Cultural Program, Dinner. !!!! Family Night tickets are available from Help Desk, Trustees, Ward Leaders and Family Night Committee Members. tickets can be purchased with payments !!!! We are reminding everyone that the Sight and Sound Lancaster trip is tomorrow. Please report to the church at 7:30 am on Wednesday, December 27, 2017. There are 2-Captains (leaders) that are assigned to each bus. Please follow directions from each leader on the bus. Absolutely no alcoholic beverages are allowed inside the bus and entire trip. Tickets for the show will be distributed by leaders in each bus.We are requesting to every family to bring any light food to share in their buses. Also, we are requesting your prayers for this family trip to be successful and blessed. Thank you for your support and cooperation. Monamma Kokkad's husband, Jose Antony entered eternal life in India a few hours ago. He was 74. Monamma who was the Chief Guest of our Family Night in July is the older sister of our parishioner Leenu Dominic Vayalumkal. Our condolences to the family and prayers for the dear departed. May God grant Mr. Jose Antony eternal life and let perpetual Light shine upon him. We are reminding everyone that the date of the Sight and Sound Lancaster trip is approaching. Please report to the church at 7:30 am on Wednesday, December 27, 2017. There are 2-Captains (leaders) that are assigned to each bus. Please follow directions from each leader on the bus. We tried to accommodate all friends together in each bus. Absolutely no alcoholic beverages are allowed inside the bus and entire trip. Tickets for the show will be distributed by leaders in each bus. If you have not signed the waiver form, please see an SMCC Committee leader after the Christmas mass. Because of increased capacity, we had to move our lunch place (China Buffet) to Golden Corral buffet. Please help us accordingly. after the Christmas Eve mass!!! and ending at Roy Joseph's house at 72 Haver Mill Rd, New City. Family Night Tickets will be available from Helpdesk with Payment after Sunday Mass. A reminder that we will have our December monthly youth meeting today from 6:30pm to 9 pm at our church. We will be adoring the Blessed Sacrament (downstairs in the hall) in the first hour and will have food, activities, and fellowship during the remaining time. Please send your children (8th grade and above) to this gathering! Friday (12/22/17) 6.45 pm to 7.45 pm. Saturday (12/23/17) 11.00 am to 12 noon. Please see the flyer for the family night 2018. Please contact Trustees or Family Night Team for the tickets. We will have our next monthly youth gathering on next Friday, December 22nd from 6:30pm to 9 pm at our church. We will be adoring the Blessed Sacrament in the first hour and will have food, activities, and fellowship during the remaining hour. 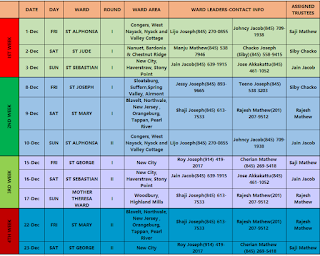 Our Ward based Christmas Carol entering 3rd week and Please see the schedule of this week. 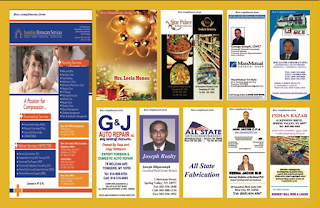 Ending -Abhilash George House at 16 Prince St, New City, NY 10956. Ending - Alex Manakatt House at 19 Brookline Way, New City, NY 10956. 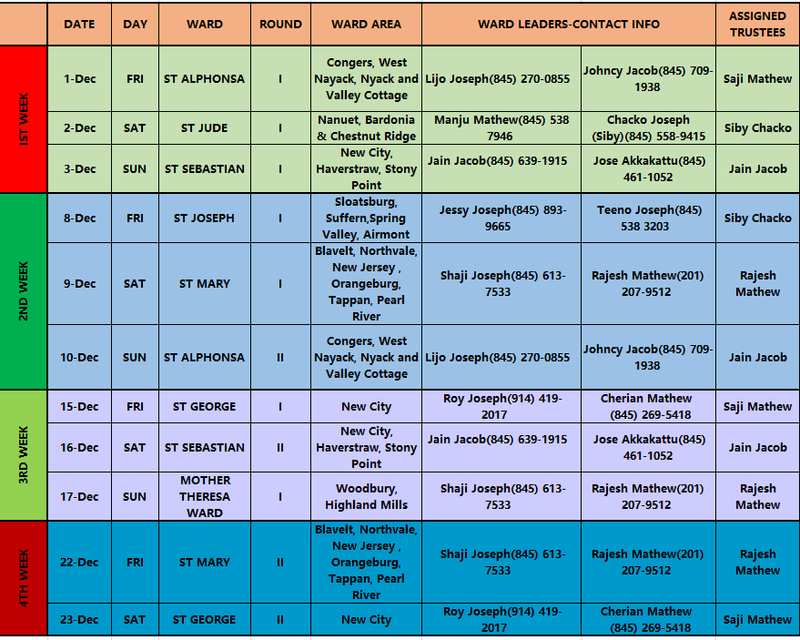 Please contact Ward leaders for the timing of home caroling and for the latest schedule. A meeting of the Parish Council members and interested volunteers will be held in the church social hall this Thursday at 8 p.m. Achen will preside over the meeting and guide us with preparation for the event. !!!! Family Night tickets are available from Help Desk, Trustees, Ward Leaders and Family Night Committee Members. Please confirm your tickets as soon as possible on or before December 17th Sunday!!!! 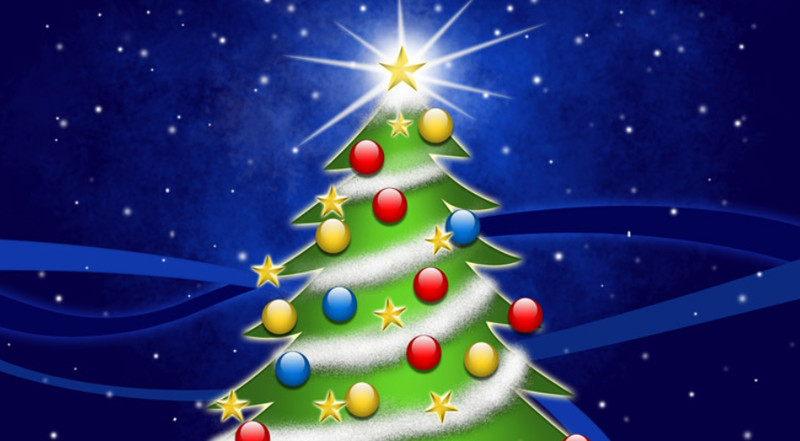 Please join us for the lighting of the Christmas Tree in the Church Social Hall after the Malayalam Mass tomorrow. The Christmas tree will be lit shortly after CCD and all the children are requested to stay in the Social Hall for the ceremony. It is that time of the year again when friends and family gather to share the holiday season with Christmas Carol. Our Ward based Christmas Carol starting today in St Alphonsa Ward. All Parish members are requested to contact their Ward Leaders for the latest schedule of Christmas Carol and to make arrangements for the home caroling. Please see the contact information below. This Sunday after the Malayalam Mass, we will kick off the Family Night Ticket Sales in the Church Social Hall. Please contact Mr Varghese Panthapattu at 845-300-5881 or any Trustees for reserving kick off time tickets. Family Night tickets are available from Help Desk, Trustees, Ward Leaders, or During the Christmas Carol through Family Night Committee Members. Please confirm your tickets as soon as possible on or before December 17th Sunday. Details: 3.30 pm - 4.30 pm - Social Hour with appetizers. 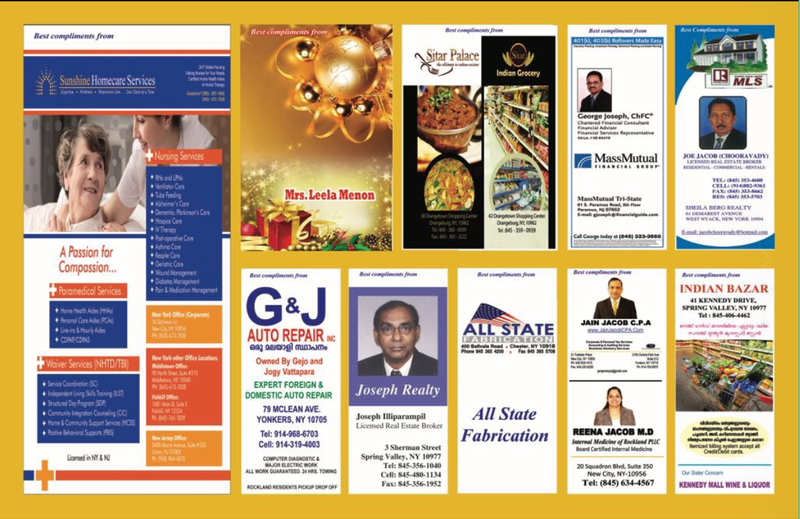 Venue: Knanaya Community Center, 370 Willow Grove Rd, Stony Point , NY. A reminder that the deadline to sign up for Family Night performances is this Sunday, December 3, 2017. You can sign up online by clicking the link below, fill the attached sheet, or at the Help Desk on Sunday after Qurbana. Family Night will be held on January 6. 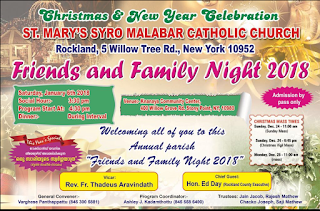 2018 from 3:30 pm to 10 pm at the Knanaya Center in Stony Point, NY. Please contact Ashley Kadamthottu (845-558-6490) with any questions or concerns. Here is the Advent message from our Bishop Jacob Angadiath. St. Mary’s Youth - Thanksgiving Potluck and Lock In Tonight! Our annual youth potluck will be on Friday, November 24th from 5:30 pm to 9:30 pm. We will start with youth mass and adoration and then share a traditional Thanksgiving meal together. All young adults (up to age 35) are welcome! Following the potluck, there will be a "lock-in" or sleepover for GIRLS 11th grade and above to discuss faith and how to live out a virtuous life in today's world with fellow peers and older young adult girls. The lock-in will be Friday, November 24th 10pm - Saturday, November 25th 8:30am in the church basement. Please bring your own sleeping bag and essential toiletries. Food will be provided (including Friday dinner, midnight snacks, and Saturday breakfast). In gratitude for your service to the Church, I share this prayer on Thanksgiving Day. and that I will always have Jesus in my heart. I am blessed and ever-thankful. as I share God's Word and gifts. to have mercy on those in need. throughout my community and in my home. and invite God's grace into my life. so we could know the power of forgiveness. May you have a blessed Thanksgiving with your family and friends. Contact: Teena Roy (teenar27@gmail.com) or Ashley Kadamthottu (ashley.kad@gmail.com) for more info. Contact: Florance Thomas (florancethomas@gmail.com) or Rebecca Vayalumkal (rvayalumkal@gmail.com) for details. Molly Joseph Mundanchira's dad Peter Pazhayamkottil passed away in Kerala. I express our parish's deepest sympathy to the Mundanchira family. As mentioned in today's announcements here is the link to sign up for Family Night 2018. 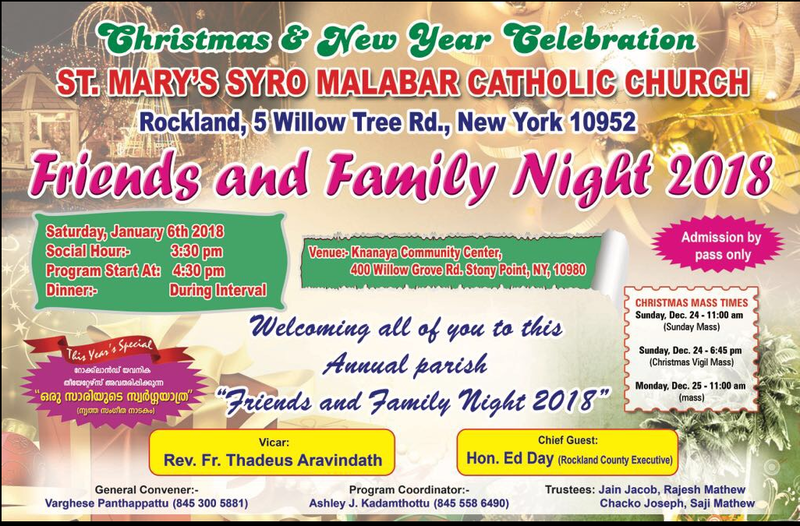 Family Night will be held on January 6th, 2018 from 3:30 pm to 10 pm at the Knanaya Center in Stony Point, NY. The deadline to sign up is Sunday, December 3 2017. Please contact Ashley Kadamthottu (845-558-6490) for questions. St Jude Feast, High Mass at 11AM. On behalf of St Jude Ward, we invite you all to join us to celebrate the Feast of St Jude today, Sunday October 29, 2017. If anyone wants to become a Presudenthi, Please come at 10.30am and contact St Jude ward leaders for the sign up. Lunch will be provided to all on this occasion. 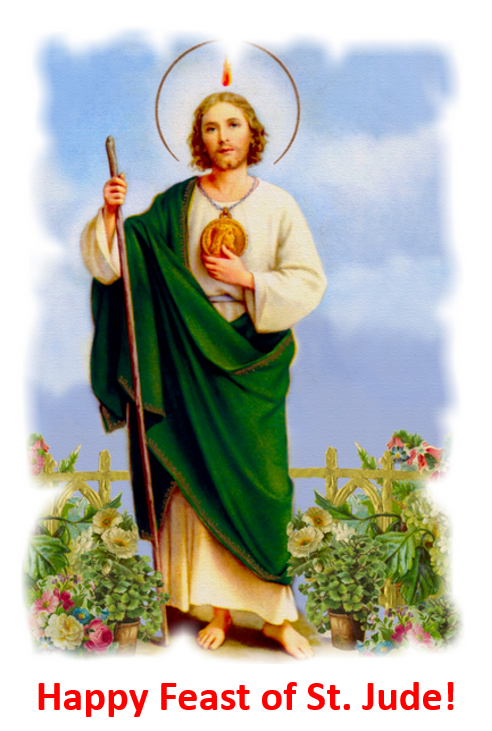 There will not be CCD class today, but parents are requested to attend the Feast mass with children. A reminder that tonight we have our first youth meeting. We will start with adoration at 7 pm in the church and then go downstairs for fellowship at 8pm. Food will be served and all are welcome!